BDM, JTAG and SW-DP interfaces provide a lot of ICE functionality at a very low cost. Silicon manufacturers offer more and more on-chip debugging features with new processors. This capability puts basic debugging functions on the chip itself. It is implemented in various processors under such names as Background Debug Mode (BDM), JTAG, Single Wire Debug Port (SW-DP) and on-chip emulation. With BDM, JTAG or SW-DP debug ports, you can control and monitor the microprocessor through these on-chip debugging services. This debugging mode runs even when the target system crashes and enables developers to continue investigating the cause of the crash. You won't waste time and target resources with a software ROM monitor, and you eliminate the cabling problems typical of ICEs. 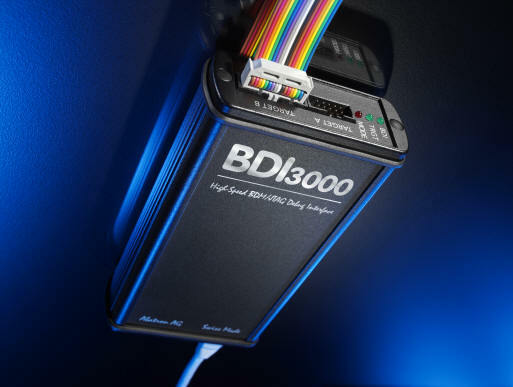 The BDI3000 features a 10/100 Ethernet link and a maximum JTAG link speed of 32MHz making it possible to load code for debugging at up to 1.5MBytes/sec. Target voltages of 1.2-5V are supported as are variable clock speeds. Just want to program on chip or external Flash ?